Phase Shift is the 5th, and last book, in the Chaos Station series. While it’s always sad to say goodbye to characters and a world I love – this was the perfect send off. Burke and Jensen put poor Felix and Zed through the emotional and physical wringer during this series and they have finally gotten their, well deserved, HEA. Not without a few more obstacles thrown their way of course. 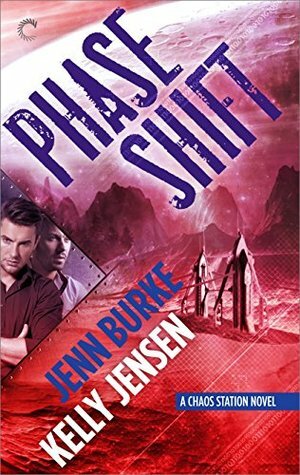 Phase Shift had absolutely everything I was hoping for...romance, action, answers and plenty of time with all of the Chaos crew. Despite not being a huge fan of sci-fi this quickly became one of my favorite series and I highly recommend it if you’re looking for complex relationships and Firefly like action! 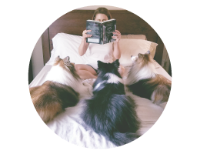 You can check out my Speed Date review of the first three book here. I usually prefer the fantasy side of sci-fi, but not always. Might have to look into this series! Fantasy is hot or miss with me so this one works more for me because it's not toooo detailed and overwhelming. Oh nice. Ending books are usually my least fave, but I've noticed several winners lately. So glad to hear that this is one of them! There's nothing better than when your favorite series end well. I didn't like Firefly lol It's not too sciency - which is probably why I like it. Just enough to be different and interesting but not so much that it's overwhelming. It's really more about the characters and ther relationships. Sounds like a series I really need to check out. I don't read a lot of sci-fi, but I've found that I really like certain books! Glad you liked this last novel. I think you might like this one Lauren. the relationships are fantastic with fun action. Glad to hear this series ended with the perfect send-off. You're SO right Karen! it's always hard to say goodbye to a beloved series and characters that you feel like you've gone through lot with! But then there's always MORE books that you're going to fall in love with! I'm glad this book was the perfect send-of to your perfect series! I know the next series you fall in love with is going to sweep you off your feet! <3 Muahh! Actually, I (crazily) started with this one, not realizing it was a series but caught on...and now I need to read the series!